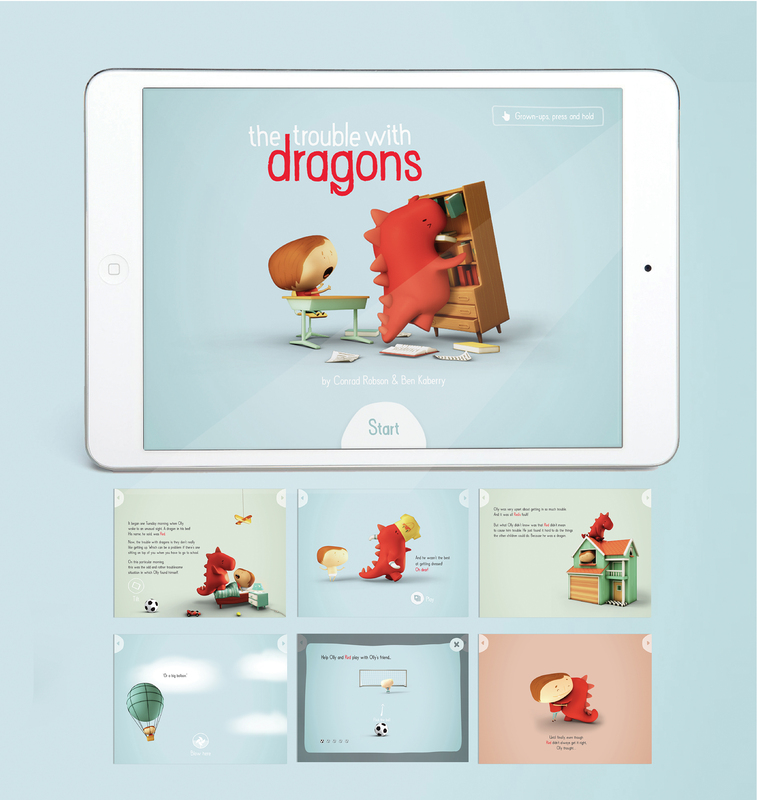 An award-winning multimedia campaign featuring a boy and a dragon was developed from a book into an app with mini games to help doctors and children understand ADHD. In the UK, Attention Deficit Hyperactivity Disorder (ADHD) is thought to affect around 2-5% of school children. The condition is typically associated with inattentiveness, hyperactivity and impulsiveness and can be coupled with sleep and anxiety disorders. Despite being a common condition, ADHD remains fairly misunderstood as to its true nature and effect on children. Communication about the condition between healthcare providers and their patients remains a challenge, particularly when trying to describe ADHD to a child. The problem lies in the current information used by doctors. Leaflets and patient information brochures can help to explain symptoms and treatment to some degree, but they are largely shrouded in medical terminology and not in a format and language familiar to a child of 6 or 7. But, digital technologies could represent a solution. Considering how commonplace devices like tablets and smartphones are to children today, taking advantage of these multimedia platforms could drive better education about ADHD. 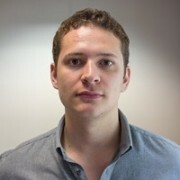 “We wanted to create something that humanised ADHD. Something that allowed a child to explore the condition and how it affected them in a way that was relevant to their world and way of thinking,” said Sarah Fleming, Senior Account Director and part of the Health and Wellbeing team at McCann Manchester that developed the campaign. The UK-based advertising agency was set the task of improving ADHD patient education by Shire Pharmaceuticals. Rather than stick to a traditional campaign, the team wanted to do something different. They wanted to put a face to ADHD because “like most things, it’s easier to understand something that you can humanly relate to,” explained Fleming. 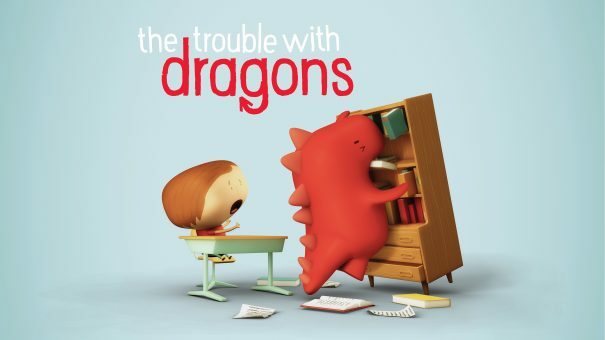 Initially, the team devised a printed storybook featuring the characters Olly and Red – two protagonists in a tale entitled ‘The Trouble with Dragons’ which describes a young boy’s struggle with ADHD. 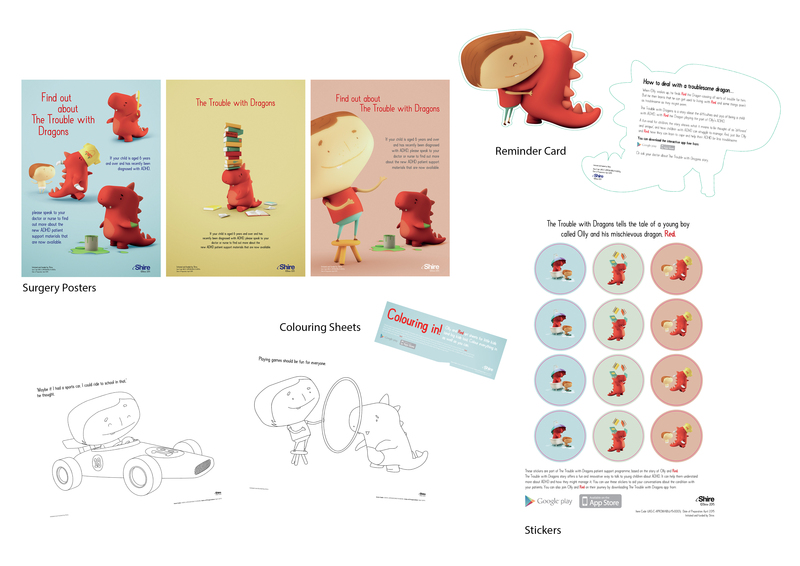 Olly is the child affected and Red, a dragon, personifies Olly’s condition, acting out the behaviours and challenges faced by a child with ADHD. The book takes the reader through specific scenarios that children with ADHD find particularly difficult, such as getting dressed in the morning or sitting still in class. The team didn’t stop there, though. They decided to extend the campaign into a multi-channel operation, complete with an app and awareness efforts like a healthcare professional-targeted email campaign. McCann decided to make The Trouble with Dragons into a multi-channel campaign, including doctors’ surgery posters, colouring sheets and stickers. The app, designed with input from doctors and children with ADHD, presents scenarios in the form of short games that require user input to solve each challenge. The original storybook format evolved into an interactive app which includes a series of mini-games. The campaign went down well with its target audience. So far, over 6,000 storybooks have been distributed via doctors to parents and their children. The app has been downloaded over 350 times. One of the most common pieces of feedback from healthcare professionals is the app’s ability to deliver a truly valuable experience – not only for their patients, but for the doctors themselves when discussing ADHD with a parent or family. This is an area where digital continues to prove its worth: in delivering value, not in how well a therapy has worked, but in the form of a better educational resource. A similar digital-focused methodology could be used for just about any condition, from simple ailments like a cold or a sore throat, to the more complex, like psychological disorders or chronic conditions. A more engaging educational experience could save much time and money for healthcare systems. McCann Manchester’s campaign is such an example. It is a patient-focused resource that improves the understanding of a condition which is often so misunderstood – a crucial step in tackling a disorder that affects so many children. The Trouble with Dragons won a gold PM Society Digital Award in the Multi-channel Campaign category in 2016, as well as a bronze award in the Digital patient initiatives category. It was also a finalist in the Innovation category. Visit the website to purchase tickets for the ceremony here.